Romania: Groundbreaking in Craiova possible in May? Tender for construction of the new 30,000-seater in southern Romania has been launched. Works may start as soon as in May 2015, leaving just 13 months for delivery of the entire project. As announced by mayor Olguţa Vasilescu, developers from across Europe have a month to build and submit their bids for Craiova’s new stadium. On January 22 the bids are to be opened and selection of preferred contractor should follow soon afterwards. Winning offer will have to be very robust, because both the budget and time frame seem very challenging, if possible to meet at all. 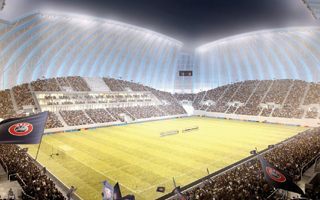 Expected to cost €55 million, the new stadium should hold over 30,000 people and be built within just 13 months! The entire contract will last 17 months, but first 16 weeks (4 months) will be needed to prepare detailed technical documentation based on the Proiect Bucuresti concept. If the tender goes as planned and documentation is ready in time, groundbreaking may take place as soon as May 2015. The stadium will cover 76,000sqm and reach impressive height of 64 meters. This will be caused by upturned roof, which should make the outer shape resemble an egg. New venue will replace the outdated Stadionul Ion Oblemenco, opened in 1967 by youth teams of Romania and Poland.